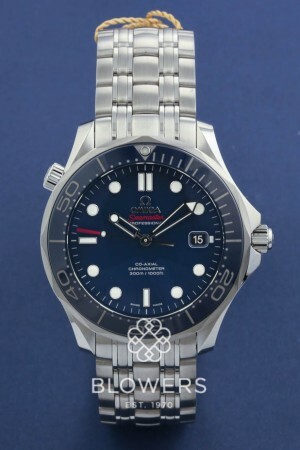 Omega Seamaster Professional 212.30.41.20.03.001. Steel case, diameter 41mm. Automatic Co Axial movement. Water resistant to 300 meters. Featuring a blue dial with luminous dot hour markers and uni-directional blue ceramic bezel. Date display at the 3 position. Brushed and polished steel bracelet. Pre-owned UNUSED. Box and papers dated November 2018. SKU: 4013272. Categories: Omega, Seamaster.